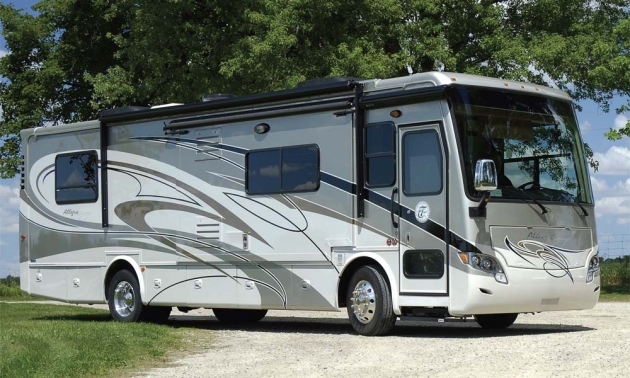 For the Tiffin family, of Red Bay, Alabama, motorhomes are more than a business – they are a lifestyle, and the 2012 model year marks the company’s 40th anniversary in the RV business. We visited McPhail’s of Harriston to test drive one of the first 2012 Allegro Breeze 32-foot units to arrive in Canada. 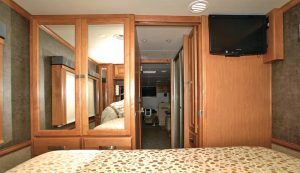 A sleek class A motorhome, the Breeze incorporates all of the quality features and workmanship that Tiffin is famous for, in a compact and fuel efficient package – it is, in many ways, the ideal approach to the needs of the modern RV family. Built on the proprietary PowerGlide® 202 chassis with Navistar MaxxForce® 7 rear diesel 215 HP engine and Allison 2100 Series Automatic Transmission with lock-up, this twin slide motorhome is a traveller’s dream – smooth as silk thanks to the air-ride suspension and full air brakes, it is an ideal combination of interior space, sporty handling, and fuel efficient operation. 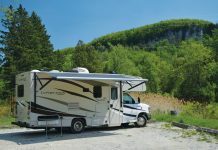 Ask any Tiffin owner to tell you about his or her motorhome and you will discover the secret of success for this family-owned and operated business. 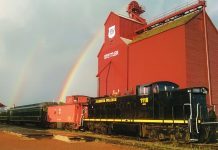 Bob Tiffin started the company back in 1972 – today, three generations of the Tiffin family work in the business. 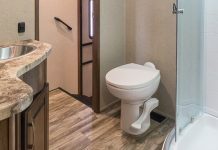 Every aspect of the Tiffin motorhome line is custom designed and built on-site in Red Bay Alabama, and the attention to detail and quality workmanship of a dedicated workforce is certainly apparent in the Breeze – even though it is at the entry level of the Tiffin line. With the slides retracted for travelling, there is plenty of space to move around in the Breeze, with all appliances and amenities accessible except for the rear TV… but you can still watch the front TV. 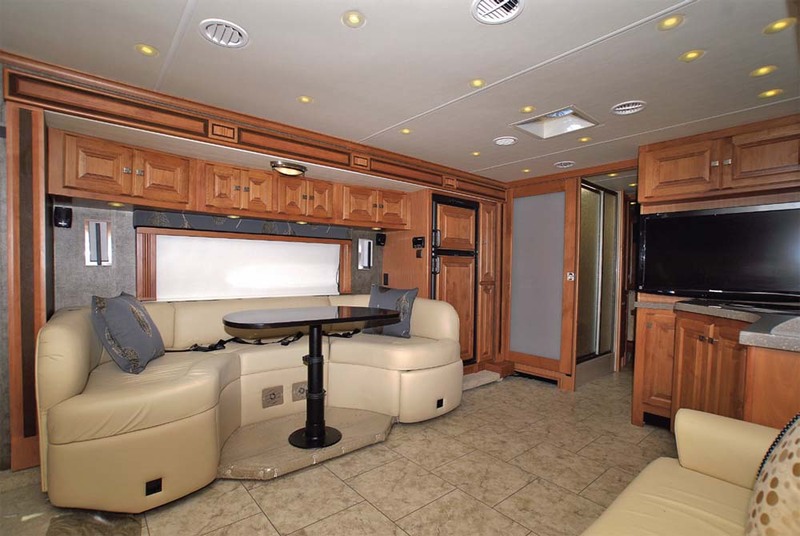 The Breeze has a very interesting floor plan, with large slide-out sections on the driver’s and passenger’s side expanding to create a very spacious front lounge area, highlighted by a U-shaped dinette facing a sofa bed. 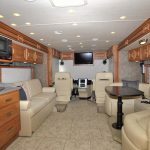 Our test vehicle featured optional leather upholstery that was supremely comfortable for touring as well as for entertaining. The arrangement of the furnishings and galley appliances provides a very convenient layout when the slides are retracted. Seating for four or more passengers in this area makes the Breeze a very versatile travelling coach. 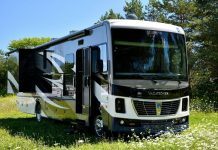 Designed from the chassis up to be a stellar performer on the road and in the campground, the Allegro Breeze features the latest in RV technology and components. 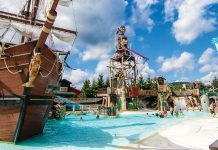 The five-layer floor has a woven moisture barrier to seal out the elements, and a durable tubular floor skeleton with high-performance thermal insulation. The vinyl tile flooring is bonded to engineered high impact oriented strand board. Sidewalls are constructed with a gel-coat exterior fiberglass panel over high performance thermal insulation, bonded to a lightweight and durable tubular aluminum wall skeleton. 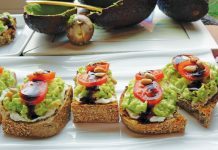 The decorative interior wall panel completes the wall sandwich. The roof is a high-tech engineering feature, with a one-piece moisture resistant molded fiberglass cap that provides insulation and strength. The durable tubular aluminum roof skeleton provides structural strength and a “Whisper Cool” A/C cooling system with return air and foil wrapped cooling exhaust ducts is incorporated into the design. 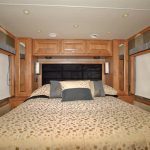 An A/C condensation drainage system runs internally through the roof insulation and down the sidewalls to direct water to drain underneath the motorhome. The roof has 5 1/2 inch formed insulation for excellent climate control throughout the year. Inside the vehicle, the soft-touch vinyl ceiling panel is easy to clean. Many of the features you would expect to see in a luxury motorhome are found on the Allegro Breeze – full fiberglass front and rear caps, one-piece tinted windshield, heated power mirrors, and slide-out awnings, of course, as well as convenience features like compartment access doors with gas shocks, and heated water and holding tank compartments. The Allegro Breeze will retain its good looks for many years, thanks to standard undercoating and front paint protective film. Extend the slides and the motorhome becomes a luxury penthouse on wheels. Note the additional lighting recessed into the ceiling, to illuminate key areas. 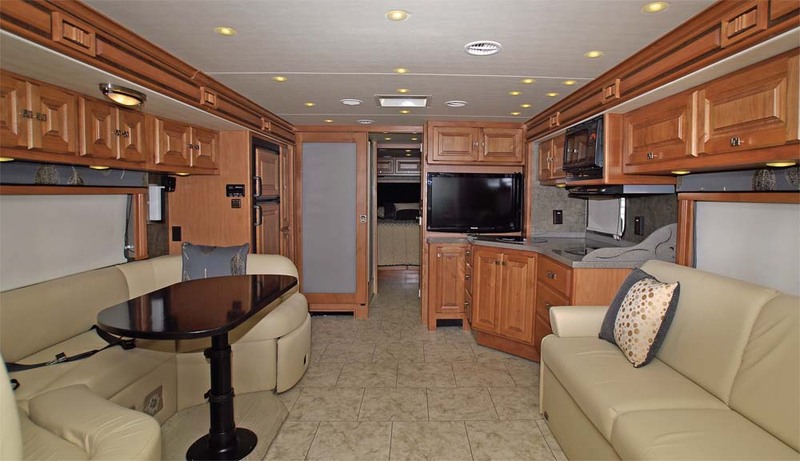 There is no doubt about it, this motorhome is a real head-turner, with Gold Coral full body paint, black anodized trim, and gleaming stainless steel wheel treatments – but the real measure of a motorhome is how it handles, and how you feel after a day on the road. The Allegro Breeze is a pleasure to drive, with supremely comfortable captain’s and navigator’s seats, available in either cloth or leather, with manual or power adjust features. Our test vehicle had the optional leather power seats, ideally suited for the couple who share the driving. Adjustable gas and brake pedals really help when your co-pilot is substantially shorter (or taller). The view from the captain’s seat is unobstructed, and the dash gauges and diagnostic system are clear, bright, and easy to read at a glance. 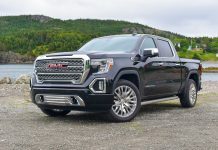 The in-dash back-up monitor is a very welcome feature, although you should always have a “spotter” assist in campsite or parking lot maneuvers whenever possible, for extra safety. We really like the side-view cameras activated by the turn signals. On rainy days, the horizontal mounted windshield wipers do a great job – on sunny days, the power solar/privacy windshield shades are most welcome – separate switches prevent accidental deployment of the privacy shade while you are driving. Side window shades are manually operated. The Breeze has a step well cover that is a real convenience while travelling – you don’t have to worry about falling down the steps at the foot of the navigator’s chair. Night driving is a pleasure in the Breeze – the dash is well lit, without the “distracting “Christmas tree” effect that you see on some vehicles. The full range of convenience items are provided in this driver’s compartment – dual dash fans for cooling and defrosting, dual 12V receptacles for your portable accessories, a snack/beverage tray, and cup holders, of course, for inflight refreshments. The in-dash CD player and AM/FM stereo features very high quality sound – our test vehicle had the optional overhead front TV, which is visible from the passenger seats in the lounge area, and from the navigator’s seat if you recline a bit – interesting entertainment, although it could be very distracting for the driver. For short stops, or for camping in areas without electrical hookups, the 6.0 KW Onan® Generator is ideal. When you arrive at your campsite, setting up the Breeze is quick and easy. 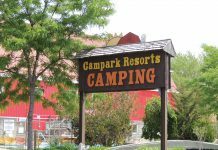 Arriving after dark? No problem – the Breeze has parking lights and exterior patio lighting, and the cargo compartments are well lit. 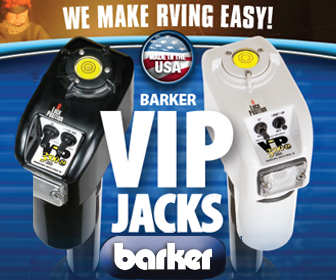 All of the hookups are located in a single service compartment at the rear of the driver’s side of the vehicle. 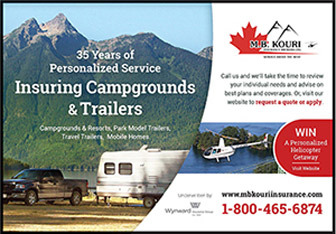 You just park the motorhome, set the brake, and let the Level Air system achieve perfect position. The 50-amp cable can be connected in seconds, then the water and sewer hoses, and then it’s a simple matter of checking for obstructions, then extending the slides. 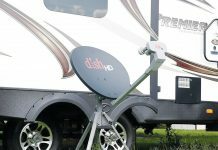 If you use the optional satellite dish, just set it up and connect the cable. The power patio awning extends at the touch of a button, the electric step extends and retracts automatically, and in less than five minutes after arrival you are ready to welcome visitors. When you leave the campsite, the process is almost as simple, and you can use the black holding tank flush system to make sure that everything is clean as a whistle for the next phase of your adventure. All of your water system hook-ups are located inside a service compartment – there is even a soap dispenser to go with the exterior shower. 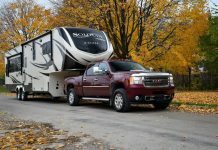 While the rear bedroom may be compact compared to larger motorhomes, it is very well equipped for a vehicle of this size. Our test vehicle was outfitted with the “Fossil” interior – a very elegant décor, with cabinetry and upholstery well above the quality you might expect at this price point. The galley featured solid surface countertops with backsplash and splashguard and a double bowl stainless steel sink, appropriately sized for RV entertaining. Appliances were well chosen, including a two-burner cook top with folding glass cover, and a microwave convection oven with exterior venting. 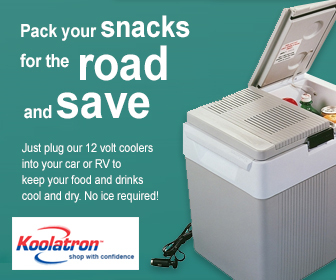 The 8-cubic foot refrigerator features solid wood panels and our vehicle had the optional icemaker. The optional central vacuum makes housekeeping a pleasure. In the bedroom, the memory foam queen mattress was very comfortable, and the four large under-bed storage drawers are very convenient. 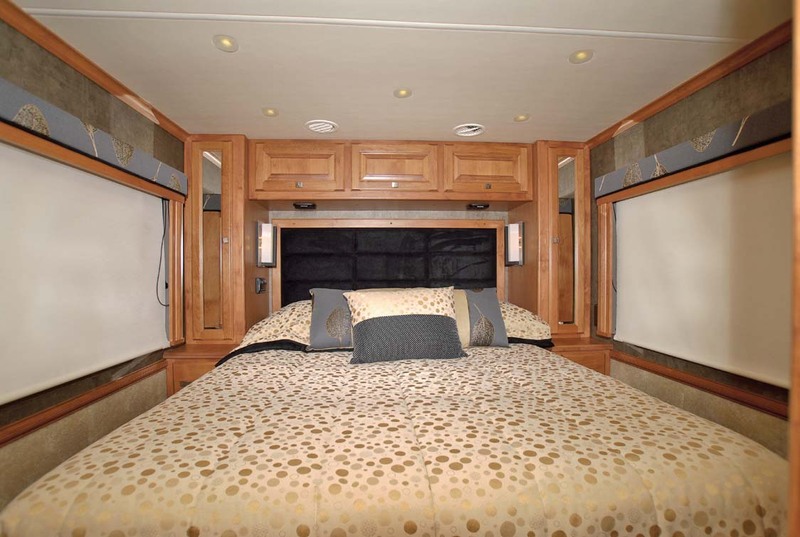 The dual wardrobes are spacious and well suited to the RV traveller. 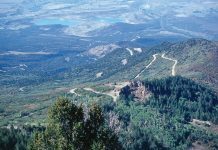 Climate within the motorhome is thermostatically controlled, with two ducted furnaces for cool weather comfort, and two low-profile 13,500 BTU roof air conditioners for the warmer weather. You can select an optional 15,000 BTU low profile roof A/C unit with heat pump in place of the front A/C unit. 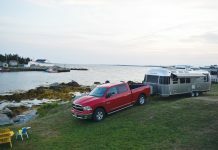 Our test vehicle had the optional LCD TV in the bedroom, and the optional vinyl tile flooring – while this may be easier to maintain, we generally prefer the warmth of the standard wall-to-wall carpeting in the bedroom. Window treatments in the bedroom were attractive, with day/night solar privacy shades. The bathroom was very nicely appointed with a molded fiberglass one-piece shower. The vanity is nicely finished with satin nickel faucet and solid surface vanity top. The skylight and Fan-Tastic Vent fan add to the overall functionality of the bathroom.